Chickadee Pond is located deep within the Wild Basin section of Rocky Mountain National Park. It's situated northeast of Ouzel Lake but because no train goes to Chickadee Pond hikers often walk right by the pond on their way to Ouzel Lake or Bluebird Lake. 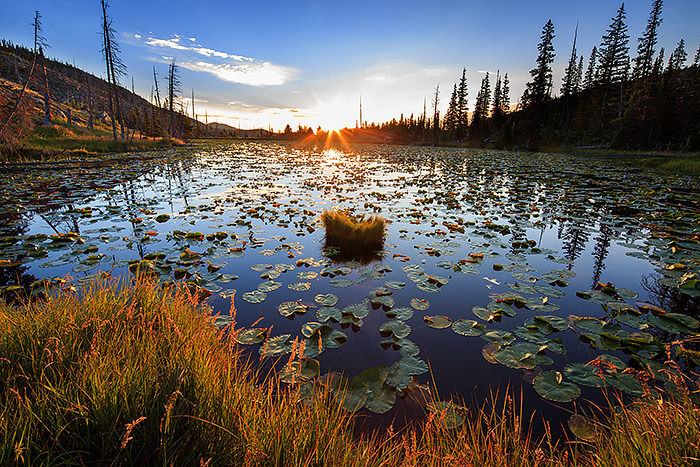 Chickadee Pond has to have one of the highest concentrations of lilly pad in all of Rocky Mountain National Park. It's late August and the grasses are already starting to show their fall colors. The Lilly Pads no longer sport flowers but the sun rising over the pond and lilly pads at sunrise made for a memorable scene. Photo © copyright by Thomas Mangan.